As part of our planned fashion show which will happen in the summer term we talked about dyes and how they might affect the environment. 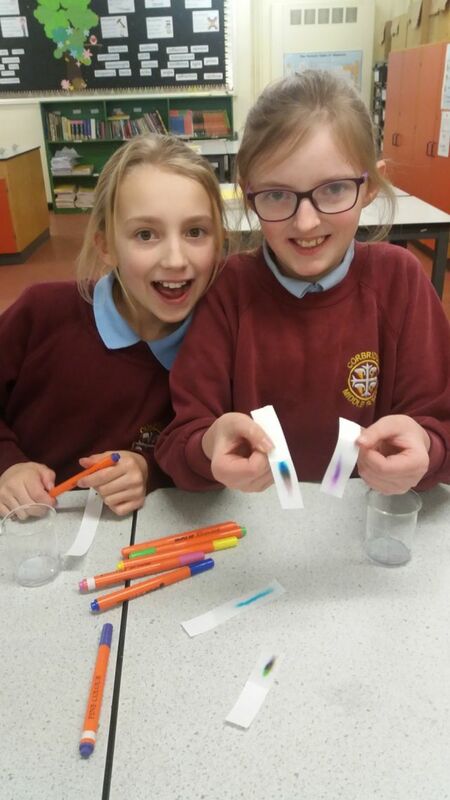 We used coloured pens and chromatography paper to see which colours are mixed for each pen. We cut the paper into short strips and placed a coloured dot of ink near the base of each strip. We then placed the bottom of the paper strip into a beaker containing a few drops of water. We then waited for the water to rise up the absorbent paper and watched as the colours separated out. The different inks are mixtures of different colours. As the ink is soluble in water they move up the absorbent paper. The more soluble the ink the higher up it rises. The black Sharpie pen did not run as the ink is not soluble in water. Dyes for clothing are also made from mixtures of different colours. Man-made dyes can be harmful and may contain toxic metals. We want to protect our water supplies from pollutants. So we want to look at plant dyes as they would be less harmful to the environment. We will try roots such as turmeric, berries, bark, leaves, and wood.